I beat this optional boss a few nights ago. It was a crazy battle. For those who don't know, the boss starts off as a lone figure; upon defeating this figure, the boss then splits up into two forms, and when you're done with those, then finally into 3 forms. 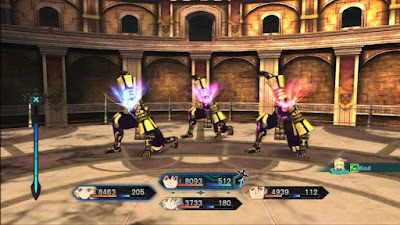 Each form has quite a substantial amount of Hit Points. I had Leia, Jude, Milla and Elize in my party. Elize is critical - her main job is to continually cast Revive so that you don't need to risk waiting for Resurrect to work. Revive is an arte that grants a single party member the ability to automatically resurrect if they are KO'd (but you can cast it on all party members over time). Her secondary task is to cast Nurse to heal everyone. Leia's tertiary job is to steal the items, once, from each of the 6 forms of the Golden Mage Knight that appear (I am not sure if this helps with stopping them from healing each other - probably not - but I did it anyway). Her secondary job is to be the secondary healer to assist Elize. However, Leia's ultimate trump card is using items - for she has a special ability that causes every item used to have an effect on all party members. So if someone else used an Apple Gel on a party member, it would only work for one party member. But if Leia uses it, the Apple Gel heals all party members. I try to keep her aside so that she doesn't get hurt (too much) so that when the party desperately needs an item (such as to heal mana or to use a life bottle) she is available to do it straight away. It isn't always possible though of course to keep her safe. I am not sure why I chose Milla. Alvin would also have been a good choice as he has high HP. Perhaps because Milla has a high Intelligence stat which would help with the damage from the linked artes with Jude. Jude's job is critical as I used him to spam Savage Roar as that seems to do the highest amount of damage in the shortest space of time (and has the great effect of knocking the opponent on the floor to give you a breather). When the Golden Mage Knight splits into two, and then later three, forms, it is critical to quickly eliminate the one with the lowest HP so as to swing the battle in your favour. This involves some degree of risk as when you go 'all out' to attack that one member you will inevitably be subject to attack yourself. To this end, I found that attacking with Milla or anyone else was simply not effective enough. Spamming Jude's Steel, which increases critical attack values, and using the relevant complementary linked arte with Milla, also helps in the long term. Overall though, as crazy as this battle was, I found the final main boss much harder. I won't spoil it for whoever is still playing it but it was a battle against X and Y. When I finished off both X and Y, Y resurrected and, sometime in the battle, re-resurrected X. It was absolutely crazy. And both X and Y could heal, and it took me a long time for me to figure out what was happening. Tales of Xillia is definitely my favourite game of the Tales series. Tales of Graces was fun and so was Symphonia, but I think Xillia was a little bit better. Yes, I am a bit of a geek.